A NASA-led and NASA-sponsored study of potential future missions to the mysterious "ice giant" planets Uranus and Neptune has been released—the first in a series of mission studies NASA will conduct in support of the next Planetary Science Decadal Survey. The results of this and future studies will be used as the Decadal Survey deliberates on NASA's planetary science priorities from 2022-2032. The study identifies the scientific questions an ice giant mission should address, and discusses various instruments, spacecraft, flight-paths and technologies that could be used. "This study argues the importance of exploring at least one of these planets and its entire environment, which includes surprisingly dynamic icy moons, rings and bizarre magnetic fields," said Mark Hofstadter of NASA's Jet Propulsion Laboratory in Pasadena, California, one of the two co-chairs of the science team that produced the report. The European Space Agency (ESA) also participated in the study. Said co-chair Amy Simon of NASA's Goddard Space Flight Center in Greenbelt, Maryland, "We do not know how these planets formed and why they and their moons look the way they do. There are fundamental clues as to how our solar system formed and evolved that can only be found by a detailed study of one, or preferably both, of these planets." A variety of potential mission concepts are discussed in the study, including orbiters, flybys and probes that would dive into Uranus' atmosphere to study its composition. A narrow-angle camera would send data back to Earth about the ice giants and their moons. Uranus has 27 known moons, while Neptune has 14. 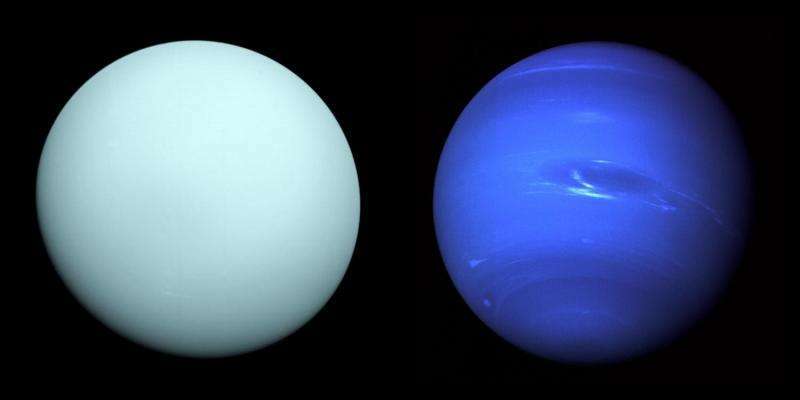 Collectively, Uranus and Neptune are referred to as ice giant planets. In spite of that name, relatively little solid ice is thought to be in them today, but it is believed there is a massive liquid ocean beneath their clouds, which accounts for about two-thirds of their total mass. 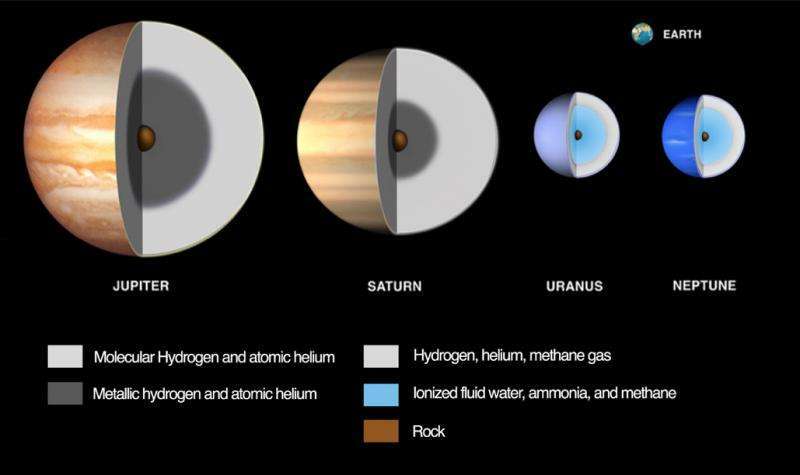 This makes them fundamentally different from the gas giant planets, Jupiter and Saturn (which are approximately 85 percent gas by mass), and terrestrial planets like Earth or Mars, which are basically 100 percent rock. It's not clear how or where ice giant planets form, why their magnetic fields are strangely oriented, and what drives geologic activity on some of their moons. These mysteries make them scientifically important, and this importance is enhanced by the discovery that many planets around other stars appear to be similar to our own ice giants. Either would be a good target, but I'd have to think with Neptune you'd get a geologically active moon (Triton) to study as a bonus. Not sure if that's worth the added cost and travel time vs a Uranus orbiter. That's a rather poor graphic. It uses the same color for outer 2 layers of the gas giants. It also, probably unintentionally, indicates there is a rocky layer between the atmosphere and water layer on the ice giants. While the shading was probably used to highlight the boundary between the two layers. The color they chose happens to be the same color indicating a rocky material.